Andrew Puzder took home $4,400,000 in 2012, 294 times what a person making the minimum wage earns in a year. 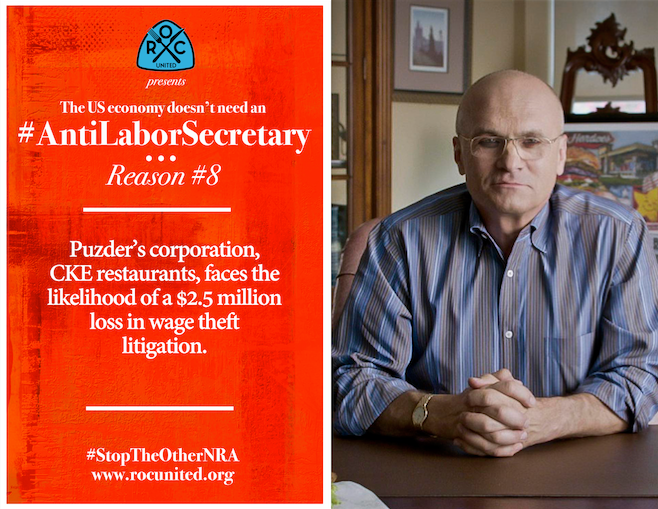 As CEO, Puzder grew his fast-food empire by paying low wages and cutting corners, like failing to fairly compensate the people who work for him with overtime pay. 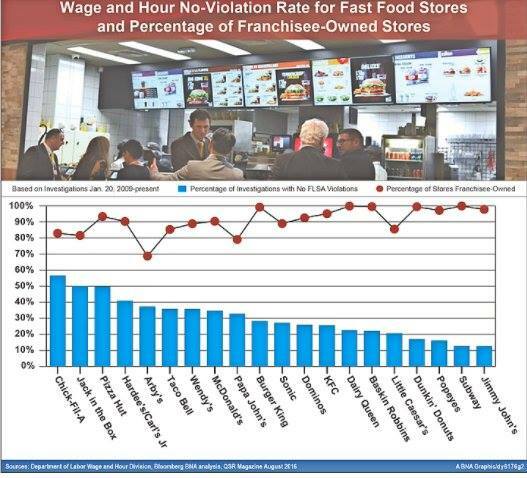 During the course of 4,000 investigations into the 20 largest fast-food brands carried out by the Department of Labor, only 40% of Hardee’s and Carl’s Jr. stores were in full compliance with the law. In total, these investigations lead to the discovery of more than 68,000 FLSA violations and some $14 million in back wages recovered for about 57,000 employees. The fast-food boss makes more in one day than his employees make in a year. Working people deserve a champion at the Department of Labor and Puzder’s proved time and time again, he’s not on our side. Has Mr. Puzder ever had to decide between paying the rent or putting food on the table while living on a minimum wage? Maybe he should live that life before he tells us wages won’t go up. I hope our elected officials understand what’s at stake. Though reports differ on exactly how much Puzder is worth, they suggest he is at least a millionaire, so his appointment would further balloon the collective net worth of Trump’s Cabinet, which is already the richest in modern history. Back in 2010, Puzder helped take once-public CKE Restaurants private by selling the company to Apollo Equities, a private equity fund that specializes in helping to turn around troubled businesses. Corporate profile pages on Bloomberg and Equilar don’t list any compensation information for Puzder. In 2014, the Huffington Post and Mother Jones reported a 2012 salary figure for Puzder of more than $4 million — via Forbes — but Puzder’s corporate profile on Forbes appears to have since been deleted. Based on other evidence, outlined below, it seems likely Puzder is at least a millionaire — although possibly not quite as wealthy as some of the other heavy-hitters among Trump’s chosen Cabinet. Education secretary pick Betsy DeVos, for example, has an estimated net worth of more than $5 billion, and commerce secretary pick Wilbur Ross’ net worth is close to $3 billion.